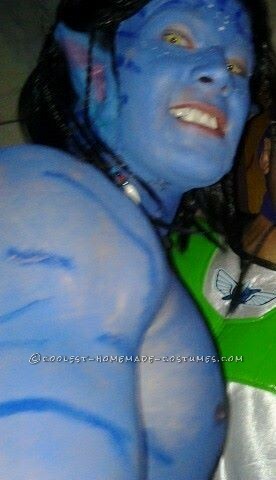 This Avatar costume was many weeks in preparation. I bought the Avatar costume at the Halloween store but only used it for the tail and the mask. I cut the ears off the mask so I could strap them under the wig. The wig, fangs, jewelry and the makeup were all purchased at a local Halloween store. I ordered the contacts online which came from England somewhere. It was very hard getting them in because it was the first time I ever used contacts. The week before my party I watched a lot of YouTube videos on doing Avatar makeup. It took me about 4 hours or so to get ready and put all the makeup on and the contacts in. I did have someone finish my back the parts I couldn’t reach. When applying the makeup I had to put a few layers on in order to get a smooth complete finish. Then I put the lines on my face and body. It was well worth all the effort that was put into this costume just to see people’s reactions ! As I walked around town everyone wanted to take pictures with me.